In the meantime, I thought I'd post an inspirational quote every Monday in order to help us get through the week a little bit easier and remind us of how powerful we truly are! I'm a huge quote-collector and have many saved up on my phone to look at whenever I'm down but this quote specifically, has been in the back of my mind lately. I can honestly say this is one of my most favorite quotes of all time. For one of my business classes, we got assigned to read the Steve Jobs biography by Walter Isaacson and I was incredibly inspired and also surprised by Jobs' journey to creating Apple and the challenges he faced through the process. Although it was a book assigned for a class, it was quite an easy read and I highly recommend it to anyone looking for some inspiration or just want to know more behind the icon. Now onto the quote...there was many quotes from Steve Jobs that inspired me in the book but this one really affected me the most. Death is not something I frequently think about and I think this happens to a lot of people my age. We just "assume" that death is far away and we put off our dreams and goals as if we're going to live forever. We sometimes even settle for less and simply hope for another opportunity in the future when we don't even know for sure if we'll be alive to see another opportunity. I know the topic seems depressing, but it's the truth. Remembering that you're here for a limited amount of time is the key to doing more in life and fulfilling your true potential. Let go of the weight that's on your shoulders from failure, disappointment, fear and everything else that's holding you down. You weren't born to live depressed, defeated, and unworthy. You deserve so much more than that. Although its easier said than done, slowly train your mind to believe that you have all the strength within you to accomplish your dreams and live a life that you're satisfied with at the end. 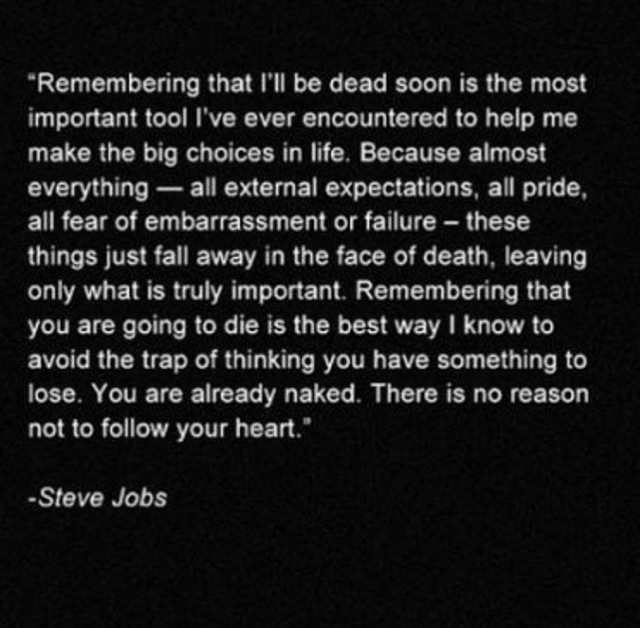 Just like Jobs said, "There is no reason not to follow your heart."